In this section we give an overview of the instrument design and its technological challenges. To match its science goals (see General Presentation and Science Sections), MUSE is designed as a wide-field integral field spectrograph assisted by an adaptive optics system. An integral field spectrograph (or integral field unit) is a system designed to give spectral information at every location of the sky within a two-dimensional area, in contrast to a classical slit spectrograph where the spatial information is limited to one direction only. Integral field spectrographs are also called 3D spectrographs because they give access to three dimensions (two for the spatial sky positions, and one for the wavelength information). These systems are made of two successive optical stages: the spatial stage whose function is to reformat the field of view, and the spectral stage whose function is to disperse and focus the light on the detector. The most critical part is the spatial stage: various methods are possible using different technology (lens array, fibers, slicers). MUSE uses a new two-mirror slicer design. MUSE is a wide-field integral field spectrograph because it is designed to have a large field of view. The larger its field of view, the more galaxies MUSE will detect, and the more information we obtain. 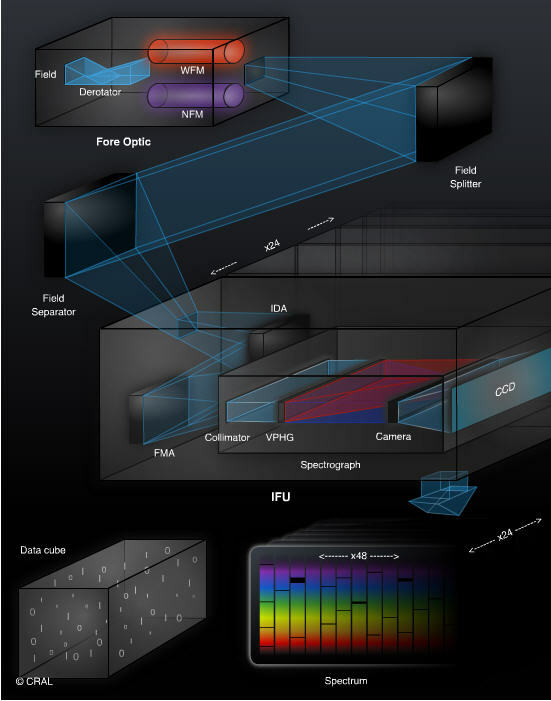 In general the field of view of an integral field spectrograph is limited by the size of optics and detectors. To overcome this difficulty, MUSE uses not just one, …, but twenty-four integral-field spectrographs! Laser beaming out from one of the VLT telescope. MUSE is assisted by an adaptive optics system which is designed to improve the spatial resolution of the VLT by (partially) removing in real time the distortion due to the atmosphere. The adaptive mirror is the VLT secondary mirror itself. In most cases, there won’t be bright stars in the vicinity of the desired scientific field of view. For this reason, the system will use 4 artificial stars as reference. These artificial stars are created by the excitation of the sodium layer of the atmosphere at 100 km altitude with 4 lasers launched with small telescopes attached to the VLT. This system is part of the VLT adaptive optics facility, which is developed separately from MUSE by ESO. MUSE has another operating mode with very high spatial resolution but a field of view eight times smaller. It is called the Narrow Field Mode in contrast with the main operating mode, also called the Wide Field Mode. Narrow Field Mode will give MUSE similar spatial resolution to space-based facilities, but with the light-collecting power of an eight-meter diameter telescope and a large-format integral-field spectrograph, making this a unique facility. A view of the MUSE instrument on its VLT Nasmyth platform. 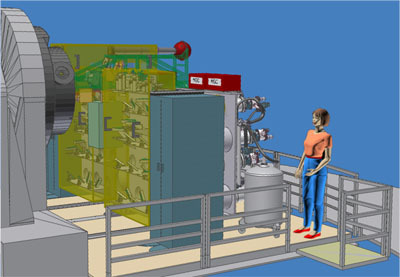 In this view of the instrument, the rear part of the 24 integral field spectrographs can be seen (grey). The Calibration unit is also visible on the upper part (yellow and green), as well as the electronics cabinet (in blue). Another view of the MUSE instrument on its VLT Nasmyth platform. In this view one can see the front part of the instrument. The fore-optics and the mirrors of the relay optics are visible under their (yellow) cover. The instrument was designed to face the following challenges: · The replication by 24 of opto-mechanical elements must be possible at relatively low cost. · Instrument throughput (or efficiency) must be as high as possible despite the required number of optical surfaces. · Instrument image quality must be very high. · The instrument shall be very stable and reliable, given that it will be mostly used for very long exposures, and for combining large sequences of long exposures. · The instrument must fit within the VLT Nasmyth platform volume (roughly 50 m3) and must not exceed 8 tons total weight. 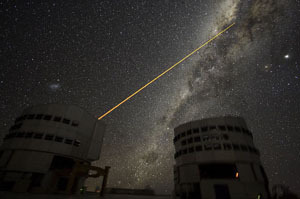 The path travelled by light in the instrument is the following: the first elements are the optomechanics of the adaptive optics system (named GALACSI) dedicated to the guiding stars (laser and natural guide stars). At the entrance of MUSE a mirror can be inserted to send light from a dedicated calibration unit. It will be used in daytime to calibrate the system. At night, the mirror is removed and the telescope field of view is sent directly to the optical derotator, which compensates for the rotation of the field of view induced by the earth’s rotation. We then have two different sets of optics, the first one dedicated to the Wide Field Mode (WFM) and the second one to the Narrow Field Mode (NFM). After passing through these optics, the light then goes to the field splitter and field separator which split the field of view into 24 subfields. From this point there are now 24 different light paths that are directed to each integral field unit (IFU) by a set of relay mirrors. In each IFU the light travels to the image slicer, which splits the field of view again into 48 slices. There is then a spectrograph, which disperses the light as a function of its wavelength (color) and finally a detector that records the signal. It is composed of two sets of mirrors. The Image Dissector Array (IDA) is made of thin off-axis spherical mirrors and the Focusing Mirrors Array (FMA) is made of small off-axis spherical mirrors. Special care has been taken with the 24 integral field spectrographs, which are central to MUSE. The slicer is based on a compact two-mirror design, suitable for diamond machining. Recent progress in the manufacturing process has enabled high precision metal surfacing with good surface roughness. Such mirrors are now compatible with optical wavelength requirements and are much more cost effective than other approaches for the large-scale production foreseen for MUSE. The compact spectrograph design achieves an excellent image quality over the large spectral bandwidth of MUSE. Each integral field spectrograph uses a detector of 16 millions pixels with improved efficiency, cooled at -130°C with liquid Nitrogen. The MUSE image slicer concept The image slicer is composed of two sets of mirrors. The Image Dissector Array (IDA) is made of a stack of thin off-axis spherical mirrors. The Focusing Mirrors Array (FMA) is made of small off-axis spherical mirrors, which finally align the image slices side-by-side before entering the spectrograph. Each MUSE exposure will have 370 millions of pixels. A dedicated and powerful data reduction system is being developed to handle this amount of data as well as the specific 3D data format. All electronics to control the detectors and instrument configuration changes are located in dedicated cabinets that are cooled to avoid turbulence generated by heat in the telescope environment. The control software is integrated into the VLT standard software and the instrument will be remotely controlled from the VLT control building.